The most important thing I learned in binding my first hardbound sketchbook journal is that the process is very forgiving and not rocket science. In fact, despite making every possible mistake along the way, it still turned out as a quite usable little mutt of a book. I took notes as I worked: reminders what NOT to do next time, which parts to skip, what really matters and what doesn’t. And now, using the medical school approach for teaching surgery (“See one, do one, teach one”) I’ll share what I’ve learned. Fortunately this isn’t brain surgery, since I’ve literally only seen one and done one. I will simply refer you to the resources I used and try to serve as a sort of docent on the journey through the process. If you are an experienced bookbinder PLEASE share any suggestions, advice or corrections and I will update this post with them. The first thing I did was buy and read several of the bookbinding books Roz lists here. While I gleaned some good information from those books, they didn’t provide what I wanted: simple, step-by-step directions for making a hardcover, casebound sketchbook journal with sewn signatures that will open flat for easy of use and for scanning the images. So I asked questions of experienced artists who bind their own books, and they generously offered valuable guidance (thanks Kate, Roz, Shirley!). I considered taking a bookbinding class but ultimately decided to do what I usually do: try to learn on my own, with help from books, friends and the internet, and by using an inexpensive ($15) DVD that Kate recommended: Bookbinding: A Traditional Technique . I printed out the supply list included on the DVD and went shopping for paper and the simple bookbinding tools and supplies. I chose Arches 90 lb cold-pressed watercolor paper. I’ve since learned about Fabriano Soft Press 140 pound paper which seems to be a favorite of some watercolor sketchbook binders as it’s smoother than cold press (helpful for ink drawing) and rougher than hot press (which has its own challenges) so I will try that next time. I think 90 lb paper is a little heavier than what is in Moleskines. Many artists swear by using 140 lb paper in their journals and just use fewer pages to prevent the book from getting too thick or heavy. I bought PVA adhesive instead of Elmer’s white glue. The PVA adhesive dries much more quickly which means you can skip many of the “Leave to dry overnight” steps in the video. The decorative end paper in the bookbinding section at Blick was expensive and the package only contained one sheet. I won’t buy that again. 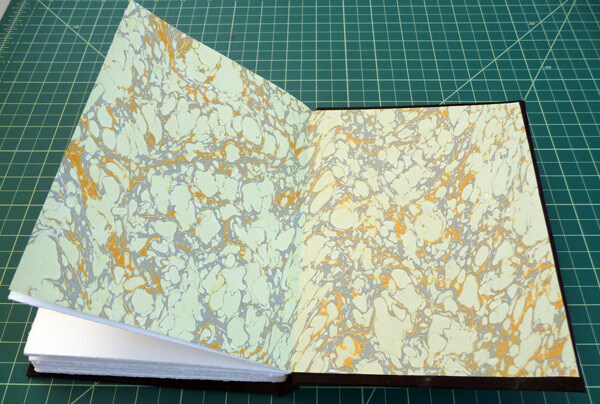 You can use any paper you want for the end papers, including the first and last pages of the book itself. They should be about the same weight as the paper in the book. Mine is much lighter, but worked fine anyway). I bought the suggested clothespins but that was silly as office supply binder clips work better. The thread, bees wax, needles and “mull” were all available in the little bookbinding section at Blick, all made by Lineco and pretty standard stuff. After watching the DVD all the way through once, I followed along with each step, pausing and replaying when necessary. Here are the notes that I made during the bookbinding process and some additional resources, some of which I suggest using instead of parts of the DVD. My notes may not make a lot of sense unless you watch the DVD or have experimented with bookbinding before. If the two sides of the paper you are using are different (most watercolor paper has two sides, each with a slightly different texture) consider making sure that facing pages across the spread both have the same texture. Roz provides a detailed explanation of how to do this, but since the difference in my paper was easily discernible I took an easier (for me) approach. I just folded half of the papers with the rougher side on the inside of the fold and the other half with the rougher side on the outside. Then I assembled each signature so that alternating spreads both had the smoother back side of the paper and then the slightly rougher side. Since I’m mathematically challenged and since the size seemed just right for my needs, I tore a few 22×30″ sheets of watercolor paper down into a nice finished size of 7.5″ high and 5.5″ wide. Before folding they were 7.5″ high and 11″ wide, evenly fitting four across the 30″ side and two across the 22″ side, while still having the grain going the same direction as the spine. On the DVD he cuts the paper but I chose to tear it. In case you’re not familiar with how to tear watercolor paper, you just fold it using a bone folder as demonstrated on the DVD and then fold it the opposite direction, going back and forth several times each way. Then you put a ruler or straightedge along the fold and tear against it. If it resists tearing do some more folding and smoothing with the bone folder. To mark where you’re going to punch the sewing holes, the DVD says to measure in 1/2″ from each end and then “evenly space” three more spots where you will make sets of holes. I did it wrong (probably should have measured from outer edge of each set of holes instead of the center of each set?) but the difference in spacing doesn’t ‘t create any problems and it seems eyeballing it is good enough for most things in bookbinding. It looks to me like the BEST WAY to mark and punch the holes is using a quick and easy template, a towel and a Kemper clay pin tool as shown here on ROZ’S VIDEO DEMO. A similar way would be to make a template as Martha described here under “VI. Punching.” (FYI, she uses a fancier sewing technique called “Coptic binding” which is usually used when the stitching is going to be exposed rather than hidden by a cover). If you like making your own equipment you might want to build the handy cradle for doing so following the directions by Jacqueline Poutasse of TJBookArts in her “Guide to Making a Moleskine Knockoff“. UPDATE: Roz, Kate and Shirley all suggest using a phone book or thick catalog or just a towel instead of bothering with building a cradle). UPDATE from Roz re: the following video: “I watched the Sage video on punching sigs (below) and while it works for him I wouldn’t recommend that. I use a template and put it inside the sigs and punch outward. That way all the holes are where they should be because alignment of holes is important (so you don’t sew through your tapes for one thing, but also so that you have a bookblock that is even at the head and tail).” In the video by Sage Reynolds that shows another way to mark and punch the holes. His sewing and knotting instructions on this video are also excellent. I followed the directions on the DVD, and made the quickie cardboard sewing frame from a piece of matboard, which worked fine, stapling it to the edge of the table. BUT…. Kettle stitches: I replayed this part of the DVD over and over and carefully examined the printed diagram that came with the DVD but still totally messed up the first kettle stitch that is meant to hold the whole thing together. There are better diagrams for the kettle stitches here and there is a great diagram for connecting a new piece of thread when you run out here. The video in #4 above has excellent instructions for making the knots and Kettle Stitches; all of his bookbinding videos on Sage Reynold’s YouTube channel are great. As you sew and knot one signature to the next, make sure to keep the signatures kind of pressed down and the thread fairly taught. Mine were too loosely sewn and as a result when they were pressed together for glueing the spine, the sewing tapes got all gathered and bunched up. 6. Trimming: I skipped this, happy with the deckled edges. I put the sewn signatures between 2 boards and clamped them together like he does in the DVD (minus the table vise–I just set the boards on the table on end) but my hands weren’t strong enough to easily squeeze the stupid clamps so things kept slipping and I didn”t get them lined up perfectly. A better way to clamp would be to use C-Clamps with 4″ throats or to make the bookpress in#9 below and use that standing on end to do the gluing. Cover the boards with wax paper and be sure that all the signatures are still lined up just right and that only the edge of the spine is exposed or the glue will go where you don’t it and will cause problems. Be sure you cut the book board so that the grain runs the direction of the spine. I used the book binder’s board that came in a package of 4 and it was not hard to cut it with a box cutter or mat knife and a straight edge. On the DVD he demonstrates marking the bookcloth and cutting the corners with “45 degree angles.” I stressed over how to measure a 45 degree angle and couldn’t figure it out, trying various tools and mathematical equations to no avail. Turns out that this is yet another step that doesn’t require precision at all. On one video I watched they just snip it off the corners without even marking them first. Forget about using the dowels and pieces of wood to make the hinge in the spine the way it shows in the DVD. The following video shows a better way. As a matter of fact, skip the DVD instructions for this entire portion and use the following video instead (or Shirley’s gluing method below the video). The video demonstrates a MUCH BETTER way than the DVD…especially the part about first gluing the boards and the spine to a piece of paper to keep them properly spaced. I didn’t see this until after I’d glued my boards to the cloth and my spacing between the boards and spine slipped off center (which again didn’t cause a serious problem). I had a really hard time applying glue to the bookcloth. It kept scooting around and I ended up with unattractive gluey spots on the outside of the cover. All the gluing instructions say to paste from the center outwards. Use plenty of glue. The PVA gets sticky quickly so work fast. Since I was using a new brush it kept shedding bristles so I washed it and pulled and pulled at the bristles until it stopped shedding and then dried it a bit. The gluing seemed easier when working with a damp brush instead of a dry one. I made this simple and effective bookpress (instructions from the DVD) and it worked great for pressing the book. See my comments on my previous post about building it. You could also just use a stack of books and some handweights and/or bricks or big jugs filled with water or a sewing machine in a case. So now I just have to finish up my current sketchbook so I can take this puppy for a joy ride! THANK YOU, Jana. Wonderful instructions. 90-lb paper will do you if you use watercolor or gouache? Probably 140 lb would be safer for a newbie like me who hasn’t learned how to limit the water. However, isn’t 140-lb paper heavier and harder to make into a book? Especially small sizes such and 4″ x 6″ or 5″ x 8″? But some rebind small Moleskines, right? I wonder whether or not they use 140 lb. I have written down the Arches and Fabriano that you recommend. I use 140 lb in journals that are probably 6 X 8 – but you need to limit the number of folios in each signature to 2. I make 6 signatures for a final book that has 48 pages = just the right size for me. Martha, in her small reloaded Moleskines uses 90 lb paper. Since I have so many sketchbooks that I don’t like, I’m seriously considering this. You’ve made it look doable. Roz has had some fabulous blue paper she’s been using lately….I think it would make me happy! Bravo!!! I LOVE your Mutt! And I applaud you for working through so many sets of directions and problem solving on your own. I decided to add my comments to the process here, so others could see them. All are meant to simplify things further. 1. Fabriano changed all of their paper so it is now “grain short,” so you will either have to stick with Arches, adjust to a slightly smaller book size,” or accept some wastage from a sheet of paper. 2. I use a 5 hole template to make holes and Martha’s method of making the template and stitching the signatures together. It is a little harder, but I LOVE to sew! You can open a big, fat phone book and use it as a cradle for punching the holes with an awl! Thanks to Gwen Diehn for this advice. 3. I have never used tapes, and therefore don’t know if there would be less gap between signatures. Gluing the spine prevents most gaps anyway. Before I started gluing the spine, I just covered up the gap with a small strip of decorative paper and I loved having the paper when I was using that page. 4. For the method I use to make a cover, there is a front board, a back board, and a spine board. I trace around each of them on the paper backing of the book cloth, making sure I know exactly how much spacing is needed between them and lining them all up along a straight line on the bottom. Then I apply the glue to each board, one at a time, and drop it into its place. Then I apply glue to one long edge of the book cloth and turn it in; then the other long edge and turn it in, and then each of the two sides sequentially. I still get an occasional small mark of glue but I actually like this part of the process because it isn’t too messy. 5. I use a mixture of PVA and methylcellulose for gluing the book cover to the book board, which slows down the drying process and gives you plenty of time for the glue step. I’ve never done it without the methyl-cellulose so I can’t compare results. 6. My son made me the same book press, and I currently have a page block drying in it after gluing the spine! I just know you’re going to love this Jana. It is wonderful to have the paper that you like, in a book that is the size and format that you like. Happy bookbinding! WOW! Well you just saved me a ton of time and stress by sharing the info about the Fabriano grain running the short way. And your directions for gluing and assembling the case were fantastic and brilliant! Thank you so much! I’ve updated my post with your very helpful information put in the right spots. I have plenty of time before I begin the next book (although I was ready to start another as soon as I finished the first it was such fun!) I’m not a big fan of sewing anymore so simple is better for me but I will definitely make the template and use that hole punching method next time. Do you use an awl or a skinnier pin tool? I don’t bother with end papers any more, just glue the first and last pages to the bookboard As you say, I do use the 140 lb., usually with three sheets to the signature. I use a punching template, as Martha does, and find that helps; like Shirley, I also set the folded signatures and template down in the gully/gutter of a big phone book or catalog to help hold things in place to punch; takes the place of a cradle. I don’t use a book press any more…just weigh everything down with a stack of books, usually putting a piece of paper towel between to keep some of the dampness away. I “relax” my folded signatures the same way, before stitching. I usually use a spine board, too, but may skip it in the future. It looks nice, but is a PTA to do. Instead, I reinforce the round spine with a layer of mull cloth, muslin, or even newspaper–a lot of my ancient, falling-apart books used newspaper! You did SUCH a fantastic job! Thanks for the additional tips Kate. I kind of liked the spine making, but I haven’t tried the rounded spine case yet as I was told it was harder. It doesn’t really look harder, though, just different. Are you saying that a spine isn’t as important when using a rounded book block? I don’t know why I feel so resistant to the wheat paste instead of PVA. 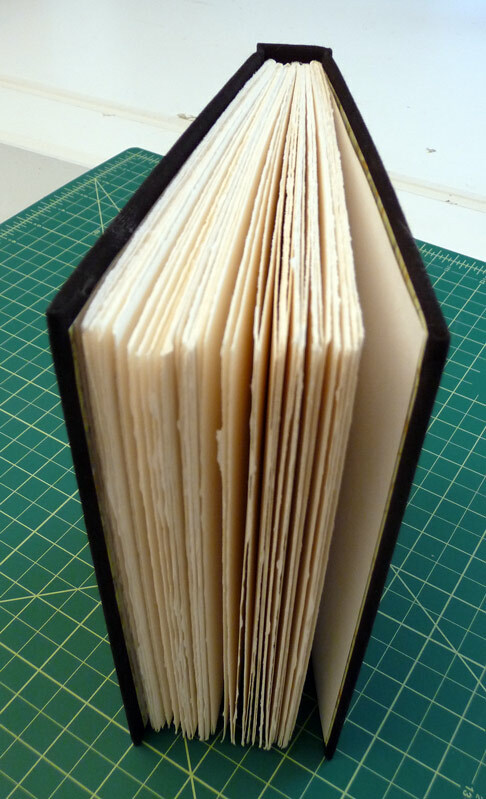 Maybe it’s a cooking thing–I’m even less confident in my cooking than I am in my bookbinding. But I’m sure it would smell a whole better at least! Great informative post, Jana! Thank you for posting the details. Even though I am not at the point of making my own sketch books, I can see myself wanting to make them in the future. I am bookmarking this for future reference. I think you did wonderfully, your book looks very handsome. Jana, great post. I’m sure you are going to inspire other folks to get off the fence and make a book. I love the book you made it’s lovely, and cries out to be painted in! I was confused however, when you said the books I’d listed on bookbinding didn’t provide step by step instructions for a casebound journal with sewn sigs that would open flat. 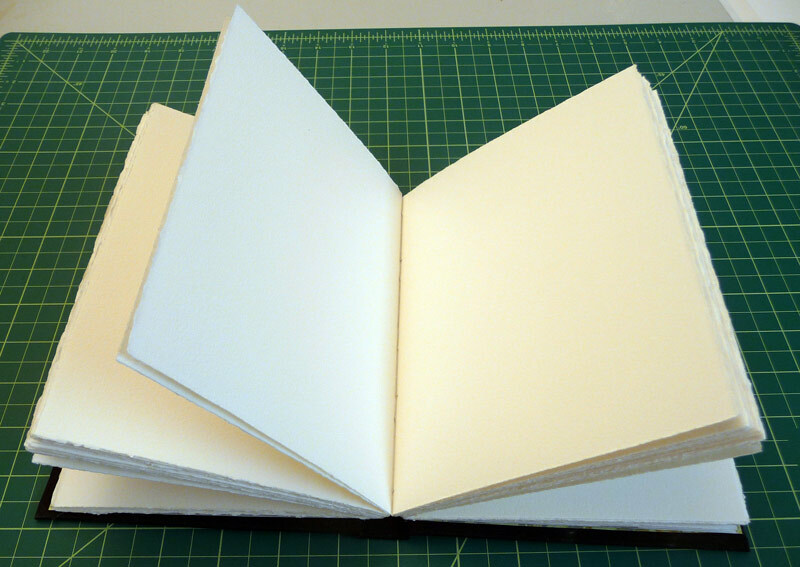 Keith Smith’s “Bookbinding for Artists,” is very thorough in his instructions. Watson and Johnson both have instructions for books sewn on tapes in the manner you’re discussing. People who work well from written instructions should find them an excellent resource for creating a casebound book, especially if they then look at some of the DVDs you’ve discovered. DVDs are a powerful teaching tool. I loved that you kept notes for yourself about what mattered and what didn’t! And the wealth of resources you looked at. You mentioned that your tapes bunched up when you went to glue the spine. After sewing, when pressing the sigs down to glue the spine you should be able to pull on the tapes and tighten them—if you don’t inadvertently sew through them, hence the constant admonition of bookbinding teachers to not sew through your tapes! This will help in future tightening. I watched that Sage video on punching sigs and while it works for him I wouldn’t recommend that. I use a template and put it inside the sigs and punch outward. That way all the holes are where they should be because alignment of holes is important (so you don’t sew through your tapes for one thing, but also so that you have a bookblock that is even at the head and tail). I don’t use a punching cradle, I just hold the template and sig together in a V formation and hold it over a folded towel on a cutting mat (to protect the awl point, and the table). Sage’s way of working from the outside just seems more labor intensive (checking back and forth) and you know me, I’m all about saving time. Also I’m a big proponent of not needing a lot of equipment. I don’t use a press. Even when I’m gluing up the spine I simply stack weights on top of the book block. I think using self-endsheets (having the bookblock’s first and last pages be the endsheets) is actually stronger than using pasted down endsheets, the tipping in of which can be pesky, especially for beginning bookbinders. While I’ll use tapes if I’m making a round back spine (because the tapes help control the rounding and the extra stress put on the spine) I don’t think tapes in general add enough strength, unless you are going to lace them through the covers as traditionally intended, to justify the extra fuss—but I realize this position is not popular with traditional bookbinders. I would encourage you to get some headband ribbon. While traditional bookbinders will advocate that headbands must be sewn (and there are books on how to do this and it is actually fun) so that the stitches come down into the book and provide even more structural strength, the type of book you’re doing is fine without that BUT the book is so much happier when it has that bit of headband ribbon at the head and tail—a nice finishing detail. and look at the small book at the far right (click on the photo so it enlarges) you can just see a little spark of orange color at the head of the spine. (You can see this on some of the other books and it’s the clearest on this little book.) That’s the red and yellow stripped headband ribbon. It just peaks out at head and tail and really gives a crisp look to your spine. You can typically buy this stuff by the yard or “card” at bookbinding supply places like Talas, the MCBA shop, maybe even Light Impressions (they sell a lot of other binding supplies). I just get mine at the MCBA shop. Again, congratulations! I think your book looks lovely and you are going to have a wonderful time filling it! And making more books! Hi Roz. I hope my post does help to demystify the process, and your helpful comments will also do the same. Thanks so much for taking the time to share you wisdom and advice! I will also update the post to include your suggestions within the post. I was delighted to hear that you don’t bother with the sewing tapes and appreciated your instructions for unbunching them (and indeed I must have sewed through them because I tried to pull them and it was no go). It’s true that “Bookbinding for Book Artists” does have instructions for making a “Flat Back Cased-in Codex” and I read the section several times. The problem is that he gives several methods for each step with thorough discussions of the pros and cons of each (e.g. under “Preparation” there is a section called “Rating the Various Hinges” that goes on for pages, just talking about hinges including, “The best hinge is a jaconnete hinge with an island paste-down butted to it.”). I think the book is an excellent reference source but difficult for novices like me to parse. I thought Sage’s back and forthing with the signatures looked a little iffy too. I really like the idea of using a guide and punching from inside the fold and will do it that way next time. Glad to know a cradle isn’t required (or a press for that matter!). The way I did it following the DVD was to punch from the back of the fold suspended between two books and too easy to misalign the holes. I’ve also used regular ribbon and fine, narrow (sometimes double) bias piping you can get at most fabric departments. Works great for headband ribbon and give you a bit of extra strength, as well. The piping I particularly like is a very fine double with navy blue and beige. Way cool! Thank you thank you thank you for providing all this information AND generating this discussion between the people I look to for info on bookbinding!! This is a wealth of information!! And I think you did an outstanding job on your mutt. Can’t wait for you to start using it!!! Well it looks right to me. Very impressive. Now you have to fill it. Won’t doing the first page be scary? Me again – only after leaving my first comment did I see all your wonderful instructions and ideas. Brilliant! Thank you. I am realy enjoying all the chat about this posting – it really deserves it as its so informative. http://www.youtube.com/profile?user=buchbinderbaumgartne#g/u. He has a lot of information in his videos, but he also does the strange thing of punching his signatures as he goes. I prefer to punch mine using a paper jig as a guide, punching from the inside out, using a sewing cradle. I made my first one from thick card, but now have one made from plywood, I think they make the job so much easier. There is a tutorial on how to make a sewing cradle here: http://www.tjbookarts.com/guides.htm along with a whole load of other information, its a very good website. Peter Baumgartner also has a free template on his website for marking sewing holes – it saves having to measur all the time which I hate. One last thing, if you continue to sew on tapes, there is a great tutorial on how to make a sewing from from an old hardcover book in ‘The Decorated Journal’ by Gwen Diehn. But I think I will be giving Peter Baumgartens method a go. The information from ‘The Decorated Page’ – should read “make a sewing frame from an old hardcover book. my 2 cents: I use YES paste and love it for bookbinding. I don’t use a brush, just my fingers. I also use lots of newsprint paper while working to keep area clean and keep the gluing under control. You make me want to start a new sketchbook! Thank you for your step by step on making your book. I love to see how other people are doing things. I hope that clarifies some things we were discussing. My post actually explains a little more detail that would have been nice to have in the video (don’t make videos when you’re tired!). Hope you’ve been making more books! I just found your post on this mysterious craft so I am attempting the process on a cold wintery day in Maine. I have Shirley’s, Roz’s and Trumpetvine blogs also open. Hopefully with all this brilliance I can figure it out. Hi Jana, Thanks for all this great info. 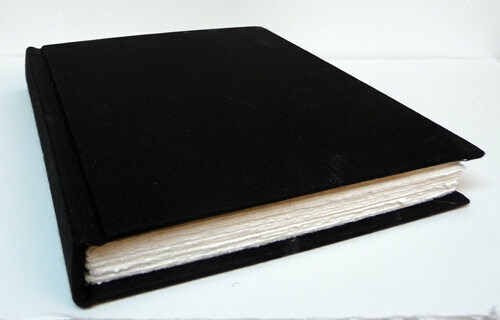 I first got the bookbinding bug from Jennifer after seeing her lovely journals. Then I read Roz’s, Shirley’s, and Martha’s blogs on the subject. Got the DCS, made first book, with lots of mistakes, made a 2nd, fewer mistakes (yay!). I used decorative scrapbooking paper for tipping on and worked fine. Now adding your tips to the wealth from all others, I’m eager to do more! Off to fill these two first! Thanks again, Ambal. That should say I got the DVD. Oops! Ambal. I always buy my paper at Hollanders.com online. You can find 24″ by 32″ sheets that are gorgeous, for as little as 3 dollars a sheet. I also buy my book board there. There linen thread and accessories are a little overpriced, but I have nothing but pleasant service with them. Love your blog, and especially love the idea of making my own watercolor journal with decent paper, hot press, instead of using ready made ones. Just another art ‘sport’ to learn and hopefully master. Thank you for all the info!